Nicholas Kerr grew up in New Zealand, holds dual US-New Zealand citizenship and is a marketing consultant in Seattle, where he lives with his wife and two small children. He has an MBA from the University of Rochester, NY, and a BA and B. Com Victoria University, Wellington. In his spare time he writes a blog, The Kerrant (www.nkerr.com), on public policy, and being a dad. A plastic bottle recycling center in Dhaka, Bangladesh in 2014. 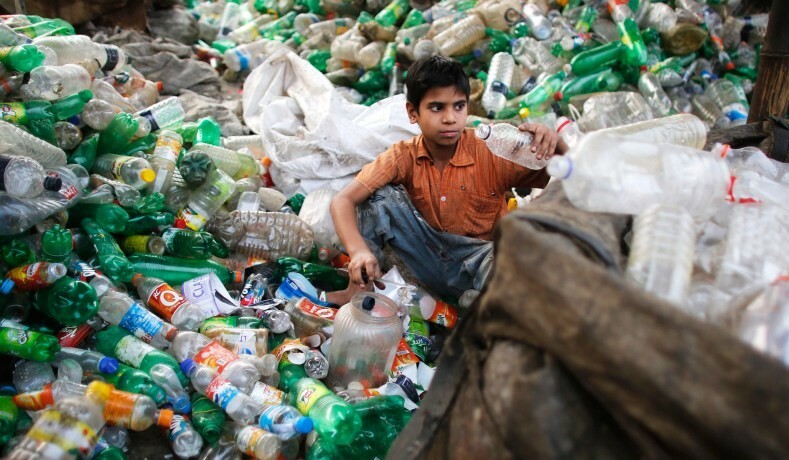 (Andrew Biraj/Reuters) They increase plastic use, energy consumption, and health risks. Better idea: Improve trash collection in Third World countries. Politicians in Seattle and San Francisco are being cheered on by some voters for their recent bans on plastic straws, having already banned plastic bags years ago. California in 2016 became the first state to ban plastic bags, New York and New Jersey are mulling similar laws, and countries from Slovenia to New Zealand are planning on banning them in 2019. Supporters of laws prohibiting plastic products encourage politicians to make meaningless gestures rather than focus on ridding the oceans of plastic and other waste. A 2015 study in the journal Science found that of the estimated 4.8 to 12.7 million metric tons of plastic that entered the ocean from 192 of the world’s coastal countries, as little as 0.9 percent of it came from the United States. As with most government dictates, plastic bans can have unintended consequences such as increasing energy use and water pollution, heightening public-health risks, increasing overall use of plastics, or harming groups in society such as the disabled and poor. For example, a recent Danish Environmental Protection Agency study found that an organic cotton bag uses more than 150 times as much energy and causes over 600 times as much water pollution when compared with low-density polyethylene (LDPE) grocery-store bags. Referring to plastic grocery bags as “single use” is almost certainly a misnomer. An Australian government study estimated their re-use rate to be as high as 75 percent. Consumers in jurisdictions with bans who reused LDPE grocery bags to line their household trash cans, pack lunches, or even pick up their dog’s poop most often have little choice but to purchase significantly higher-density plastic bags for these purposes. Bans on plastic straws have also been documented to lead to increased use of plastics, most notably at Starbucks, where the new nitro lids actually use more plastic than the old lid-straw combo they’re meant to replace. To the extent that restrictions on plastics force consumers to switch to other products, the overall environmental impact can be significantly negative. Banning plastic bags and straws is akin to sticking your finger in the hole of a dike with a thousand holes; it’s not going to help our oceans. If you worked in a small business that was losing $1,000 a month and you told your boss you’d come up with a way to save a dollar next month, you’d soon be out of a job. Cheering on politicians who propose and implement token bans on plastic encourages them to avoid doing the hard work required to solve the real problem. Drastic reductions of plastic and other waste in our oceans will come about only through working with countries in Asia and Africa to stop plastic pollution at the source. The developed world needs to encourage or assist governments in developing countries to better manage their waste. Private-sector innovation also shows promising ways it might help. The Ocean Conservancy and the McKinsey Center for Business and Environment found that improving trash-collection rates to just 80 percent in only five core Asian countries could reduce ocean plastic waste by 23 percent at a cost of around $5 billion a year. Foreign-aid budgets could be redirected to assist cities with waste collection. The Christian relief and development agency Tearfund is urging the British government to spend the equivalent of half a billion dollars of its annual foreign-aid budget to do just that. This would represent a tenfold increase; other governments could do the same. Private-sector innovation might yield even more promising solutions. David Katz recently gave a TED talk outlining how innovation could help solve this problem. Noting that 80 percent of ocean plastic is coming from countries with extreme poverty, Katz set out to motivate Third World citizens to recycle. He created the Plastic Bank, the world’s largest chain of stores for extremely poor people. Everything in the stores — including school tuition, Wi-Fi, cell-phone minutes, and electricity — can be purchased with plastic garbage. Using this concept of “social plastic,” Katz has partnered with global corporations such as Britain’s Marks and Spencer and Germany’s Henkel. These companies are incorporating in their products and manufacturing the resources that the Plastic Bank encourages the world’s poor to recycle. Significant investments are necessary to create effective waste-management systems in developing countries. With this in mind, Circulate Capital was recently formed with the support of major corporations, including 3M, PepsiCo, Dow, and Procter and Gamble. With a focus on South and Southeast Asia, this new investment fund is seeking to remove capital as a barrier to the projects required to prevent plastic and other waste from flowing into the world’s oceans. Operating from the principle that tangible social change and strong financial returns are not mutually exclusive, the fund is actively seeking proposals from businesses interested in projects in three areas of the waste-management supply chain: waste collection, the processing of mixed solid waste, and the transformation of “waste” plastics into new products. The Plastic Bank’s David Katz has rightly observed that, when faced with an overflowing sink, “it would be pointless to mop or plunge or scoop up the water if we don’t turn off the tap first.” Politicians in developed nations are ignoring the source of the ocean’s problems when they place bans on their citizens that will effectively do nothing to improve the marine environment. Solving this problem requires hard work and tough choices, something too many politicians are shirking. Voters who encourage their leaders by supporting these token gestures are simply perpetuating the problem. In the meantime, entrepreneurs such as Katz and private-sector investors are on track to do more for our oceans than the developed world’s governments combined. First published in National Review – see HERE.